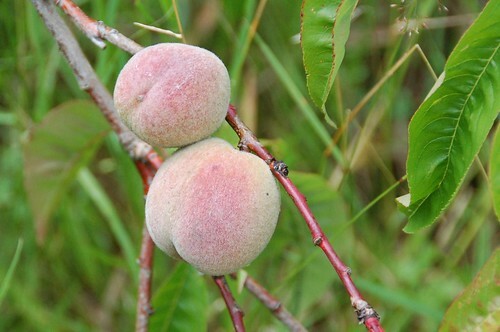 Fruit on a home grown peach tree, from a seed saved from a bought peach. The weather has been lousy for about a week and shows little sign of cheering up. I know we needed the rain but now everything is soggy and dull. Despite saying I would, I didn't spray for blight on the potatoes and tomatoes and it looks as if that omission might be a disaster. Although there are no signs of a problem yet, the continuing warm damp is perfect for blight and while it's so rainy there's not much point in trying to spray now, it would be washed off before it had settled. Still, more cheerfully (and with fingers tightly crossed) it looks as if there might be seeds sufficient to make a good sized swap list in the autumn. The Irish Preans and Striped Bunch are making babies, the Carlin Peas are weighed down with a huge crop. There will be plenty of Babington Leeks bulbils and probably a few Walking Onion topsets too. The Oca is growing well. Maybe even Tuberous Rooted pea seeds. I'd hoped to have Welsh Onion seed too but if it doesn't stop raining that's going to rot in the heads before I can harvest it. So my thoughts have turned to what I might be able to swap some of these treasures for. 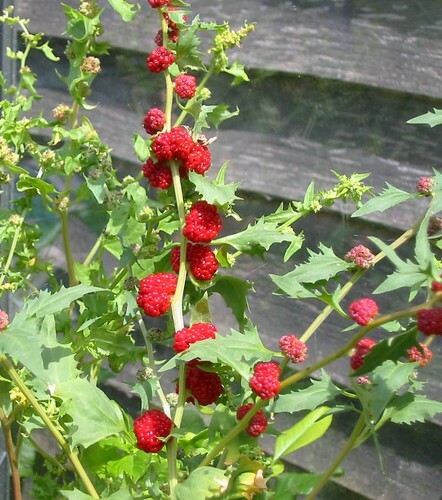 I haven't grown it for years but the Strawberry Blite, Chenopodium capitatum is a fun plant and I'd like to revisit it if anyone is saving seed for swap this year. An odd solanum I've been meaning to try is Morelle de Balbis (Solanum sisymbrifolium) also known as the Litchi tomato. I know it grows well in the south of France and I'm sure it would do here with a little care. The only thing I'm wondering about if it is susceptible to blight, don't know if anyone can advise me on this? 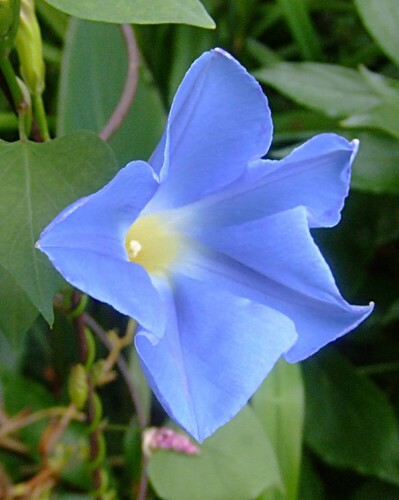 And a chance conversation on G+ reminded me how much I love Morning Glories, in particular the traditional huge sky blue sort. Anyone who could spare me a handful of a reliable selection that has grown outside for them in northern Europe would make me extremely grateful. Many thanks to Bill Barber for the photo. Oh! is that what his foilsis stuff is? I must admit I've never looked hard at it as eelworm isn't a problem here. Knew about the thorns, was hoping I could build a corral with them around the patch to keep out deer. Very cool blog, will be following if that's ok.. I've a blackberry bush that's doing just great here in Penn.